It's really easy to calculate how many spindles or balusters are required when installing the stair balustrade/handrails with a simple formula, depending on the size of the stair spindles you are fitting. In order to satisfy building codes, generally stair spindles need to be installed with gaps no wider than 100mm (4") at the widest point (double check with you're local building inspector if you are unsure as this may vary depending on your location). You can test this by making sure a 100mm sphere/ball is not be able to fit between them at any point. The theory being that a child could fit their head through a gap like that and fall potentially strangling themselves or fit their whole body through and fall down the stairs. There are a couple of different sizes of spindle but as a general rule approximately two spindles are needed for every stair tread to meet the regulations and also to look in proportion. So, if I have treads I count them up and simply double the answer to figure how many spindles to buy. I always add at least two for waste/extra or in case one has a bad knot or other imperfection when they arrive on site and it can't be used. Sometimes however there are no treads, like when fitting a balustrade to garden decking, a landing, a porch or a veranda for example or when installing a straight gallery of stair spindles. In this instance, I use this simple formula for working out the exact number I will need in order to comply with the building code and regulations (of less than 100mm gaps). 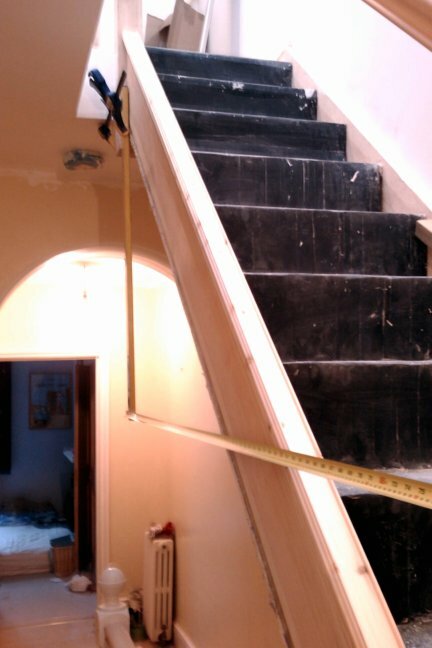 Using a tape measure, first take an inside measurement across from newel post to newel post. You can see from the picture below how I measure this on a long run when the posts don't extend enough. I do everything horizontally because it is a 100mm spacing horizontally that you need to keep within. If the staircase is long, clamp a long, straight spirit level to the front edge of the top newel post so it hangs down lower. Next, hook your tape measure to the spirit level so you can measure to the next newel post in a perfectly horizontal line from the floor. If you are fitting 32mm spindles - divide the measurement by 112. When installing 35mm spindles - divide the measurement by 115. Or if you are installing 41mm spindles - divide the measurement by 121. 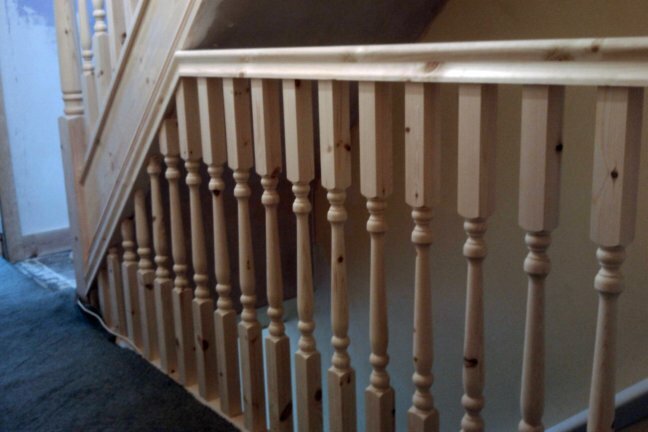 The answer you get will almost always be a decimal, round it UP for the correct number of stair spindles needed. This calculation will give you the minimum number you need to satisfy the building regs, quite often I fit more to bring the gap between the square section of each one down to 75-90mm. When installing turned spindles I keep the spindle spacing less than 85mm to ensure there is less than a 100mm gap at the widest points. Now you know how many, how do you go about installing the spindles? Once the handrails are fitted and you've have calculated the correct number of balusters, you can use the installation tips here to get spindle spacing's perfect.